Our new station opens on Monday. To celebrate – and to see exactly when trains arrive and depart from Fishguard and Goodwick – Fishguard Trains today launches a brand new timetable. Jointly designed and published by Fishguard Trains and Seaways Bookshop, the new timetable is itself a first: On just one bookmark-sized card, you can see at a glance ALL services to and from Fishguard and Goodwick across 24 hours and all seven days of the week. 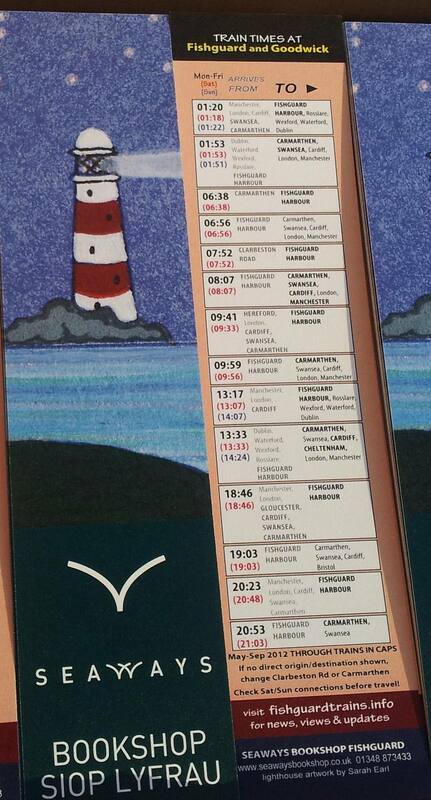 The timetable shows major origin and destination stations, and timetable variations on Saturday and Sunday. However you use it, you will never need to wonder when the next train leaves Fishguard and Goodwick. They’re all here. The new timetable is available – free of charge – at Seaways Bookshop in the centre of Fishguard – and at other outlets in future. Call into Seaways soon to make sure of getting your copy! Looks very impressive – well done to all concerned. Once again, congratulations Fishguard Trains for coming up with an inventive timetable to help publicise the service. Any chance of putting a digital version on your timetables page too? Another thing that might be useful is to publish (on this website) an updated version of either the Fishguard & Six Nations timetable or this one: http://fishguardtrains.info/wp-content/uploads/2011/08/Fishguard-trains-and-connections1.pdf to show times at points other than Fishguard. 1 The focus this month must be on the new station, and encouraging its use. 2 The unique feature of Fishguard and Six Nations is that it showed ALL public transport links through Fishguard, train, bus and ferry. Before we can do likewise with a re-opened F&G Station, we need to see how bus links in particular settle down. We suspect further changes (re bus times and routes) are just round the corner, so for the moment it’s wait-and-see. We don’t have the resources to re-issue timetables every few weeks. 3 Fishguard Trains is run entirely voluntarily. We receive no funding for our work. So we must focus our efforts on the top priorities. That’s not to say we won’t be producing more timetables in future, but hopefully it explains the position just now in May 2012. Please do all you can to promote use of the new bookmark timetable. Nice timetable there Spad. Rhydgaled – a timetable of the train services only is available here (via Download) http://www.nptf.co.uk/materials/cat_view/9-documents.html. I agree that it would be great to see a version also showing the connecting buses and ferries, but as Spad notes – we’ll probably have to see how things settle down over the next few weeks before anyone tries to finalise a fuller version. Excellent work on producing this timnetbale I will try and get a copy hopefully if I am in Fishguard on Monday. How good is fishguard as I am looking for something to ocupy my time between the 09:43 arrival from Pyle and when I depart on the afternoon boat train to Cardiff. How good is Fishguard …. How good is Fishguard!? Browsing in Seaways Bookshop, a fine independent bookseller; Mug of tea and an egg & chips or bowl of cawl in the traditional cafe on the square; Artworks and deli food in the West Wales Arts Centre; more deli food to eat and to go in the Gourmet Pig; the Last Invasion Tapestry in the Town Hall gallery – an astonishing work of fabric art and creative history that rivals the Bayeux Tapestry; Lower Town harbour, good enough to film Under Milk Wood, and good enough for a lazy picnic lunch on the quayside; the coast path – best in the Old World, and second best on our planet. I’d head up to Fishguard on the bus, then have a look around Seaways Bookshop followed by the Last Invasion Tapestry in the Town Hall. Pop across the road to St Mary’s Churchyard to see Jemima Nicholas’ gravestone then get yourself a coffee in the chippy on the square. Head down main street past the Fishguard Arms ( a great place for a pint possibly), then head down to Lower Town for that picture postcard view. The Ship in Lower Town is my favourite pub in the area! Return to Goodwick by taking the Marine Walk along the coast to give you a small taste of how good the coast path can be – you get great views of the Harbour at Lower Town as well as the one at Goodwick. Once you get home plan your next trip and give yourself a full day so that you can catch the Strumble Shuttle from Goodwick to Strumble Head, view the Lighthouse and take the Coast Path back to Goodwick past Carregwastad! If that coastline doesn’t inspire you to come back for more I’d be very surprised! The National Rail Timetable shows the lunchtime Sunday train as not calling at Fishguard & Goodwick – is this correct, or is it yet another NR error? NRE correctly shows Sunday lunchtime trains calling at Fishguard and Goodwick from May 20th, as shown in the Fishguard Trains bookmark timetable. Did you enter an earlier Sunday, before the station opens on May 14th? Table 128 of the National Rail Timetable valid from 14/5/12, which I downloaded from the NR website as a pdf, does not show a calling time for the lunchtime Sunday trains in either direction – it does show all other trains as calling at Fishguard & Goodwick. Fishguard & Goodwick station 14th May 01:00 blowing a gale and raining hard. Down Boat 01:20 does not stop; Up Boat stops at 01:53 so first train to call. So NR timetable correct, ATW incorrect. 2 wet persons on station to wat h; one joins train. Station gates not open….hopefully someone remembered to show up and open them for the morning trains. Busy day, but unforgettable. Arrived on the 23:45 Swansea to Fishguard into the Harbour, for a very wet walk to Goodwick (for the last time possibly!!). Goodwick station yard fenced off, but the fences were not locked so no problem to get in (could have moved them for a car if needed too). 01:53 back up to Whitland as the only passenger to join the first regular passenger train from the station for 48 years, 1 month and 10 days! Later, caught the 06:56 to Clarby Road and back before heading to work! Returned to the station for the 13:00hrs opening ceremony, great to see so many of the characters who had played a big part in getting the station project completed so soon. Wales showed today how we do things – quickly, to a reasonable budget with everyone pulling together. The new devolved Network rail route management structure for Wales has really laid down a marker to the rest of the UK to follow. Great to see the TV cameras down there today – more priceless publicity for the new station and the train service on the news programmes tonight. The radio waves have been full of the news about Goodwick returning to the railway fold all day too. Great, and shows that campaigners can achieve wonderful results with persistence and patience. Those involved in making today happen know who you are – well done to all, and thanks for making today such a special, wonderfully memorable day!